The U.S. government has already imposed $250 billion in trade tariffs on Chinese products, representing nearly half of the total import volume from China in 2017. On Jan. 1, 2019, the broad tariff rate will increase from 10% to 25%. China has responded with $60 billion in retaliatory tariffs, but the White House has stated that more tariffs will be instituted if upcoming negotiations transpire poorly. 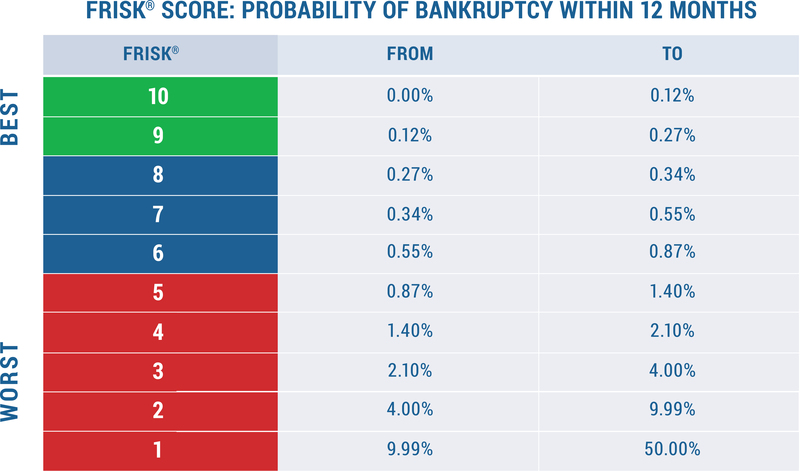 The FRISK® score, which is 96% accurate* in predicting public company financial stress and bankruptcy risk. Commercial credit report coverage spanning more than 58,000 global public companies and nearly 80,000 of the largest U.S. private companies. Proprietary subscriber crowdsourcing, a powerful scoring model that derives research patterns from thousands of financial experts globally. Supply chains are changing sourcing and managing higher cost inputs because of escalating trade tensions. Some of these costs will continue to be passed onto end markets, yet margins and sales are already being affected. While the broader impact to businesses has been limited so far, the U.S. Chamber of Commerce warned that retaliatory tariffs could require the U.S. government to provide billions in aid to various industries. CreditRiskMonitor’s fundamental service allows subscribers to monitor one of the most worrying things that could result from tariffs – corporate financial risk. CreditRiskMonitor provides detailed financial analysis, risk modeling and timely news to stay ahead of trouble. With this comprehensive data, subscribers can monitor the health of their financial counterparties daily. The impact of the tariffs will show up in the FRISK® score over time, as they impact every aspect of the score's inputs. For example, crowdsourcing will pick up when risk professionals are increasingly worried about a company, as will market sentiment. Over the long haul, the impact will flow through a company's financial statements, which will, in turn, impact the financial metrics within the FRISK® score. And credit rating agency changes will get reflected within the score as they occur. So what does it all mean? For most companies, subscribers won't need to change what they are doing today. They can simply continue to use the FRISK® score as a first line of defense against risk that arises from tariffs. However, some industries are going to be more impacted than others. In such cases, which notably includes the auto sector, risk professionals should be especially careful with companies that are already financially weak. This is where the broader array of services the CreditRiskMonitor provides takes center stage. Ford’s CEO stated $1 billion in lost profit due to higher metal tariffs; and September sales in China declined 43% year-over-year. General Motors suggested tariffs will hit profit and may result in a "smaller company." Tesla announced in a press release that it is operating at a 55-60% cost disadvantage to Chinese-domestic automotive production due to auto tariffs. Navistar executives stated in their third quarter conference call that rising metal prices will impact at least half of their commodity costs. Tesla’s current FRISK® score indicates significant financial stress and an elevated probability of bankruptcy. The recent reduction in the score was driven by subscriber crowdsourcing. This data is derived from thousands of financial experts globally, including credit managers. When subscribers become particularly concerned about a business, they exhibit certain research patterns. We then incorporate this leading high risk signal into the FRISK® score. Tesla’s current FRISK® score indicates significant financial stress and an elevated probability of bankruptcy. If Tesla experiences additional weakness, it may be unable to service its long-term obligations. Part of this score trending lower was driven by an increase in Navistar's adjusted stock price volatility and a deterioration in market capitalization trends following third quarter earnings. A noteworthy mention from the conference call was higher input costs: “…we continue to face higher freight costs and higher commodity prices, particularly for steel, which has increased over 30% since the calendar year began.” The company’s total liabilities to market capitalization metric also deteriorated, as it increased from approximately 2.6 times to 3 times. Navistar’s Z''-Score ratio remains in negative territory and has been held down by its steep financial leverage. If Navistar’s trucking end-markets were to experience deterioration, the company would have difficulty servicing its obligations. Supply chains, procurement professionals, credit managers and corporate treasurers use the CreditRiskMonitor service to actively monitor the financial health of their counterparties. Many supply chains and purchasers have already been forced to alter policy and work with new companies; for now, tariffs have not materially impacted the broader economy. Continuing to monitor FRISK® scores should be sufficient to keep subscribers on top of this issue in most cases. That being said, tariffs have led to notably higher costs for some industries, including auto manufacturing. Those risks can be monitored through CreditRiskMonitor’s vast breadth of coverage using the FRISK® score, the news service and other available resources.